Would it be easier to pass on a piece of chocolate cake if you knew you could have it as early as tomorrow, and yet stay on your diet? Alternate day dieting is fast becoming one of the most popular trends in eating since The Atkins or South Beach diets. The idea is simple. By eating a fraction of what you normally would every other day, you compensate for the days in between when you eat normally, or even indulgently. A sample meal-plan on the alternate day diet would include eating whatever you want on Sunday, Tuesday, Thursday, and Saturday, followed by a meager 500 to 600 calories on Monday, Wednesday, and Friday - made up perhaps of yogurt for breakfast, soup for lunch, and salad for dinner. Help you lose weight (Johnson lost 35 pounds after following the diet for three months). Reduce oxidative stress markers - indicators of free-radical damage, which leads to cancer, heart disease, arthritis and more. Lead to long-term health improvements by activating a genetic mechanism called SIRT1. This so-called "longevity gene" has been shown to promote the long-term survival of irreplaceable cells, thus contributing to extended life. 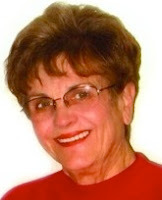 Help people with inflammatory disease. A study by Johnson, published in Free Radical Biology & Medicine, found that asthmatics had a significant reduction in their symptoms after two weeks on the diet. Most people are unable to restrict their caloric intake on a consistent basis. However, most motivated people can restrict themselves every other day to 50% or less of their normal calories. This discovery is what makes the Alternate-Day Diet successful. In other words, people are able to do for one day what they are unable to do every day. 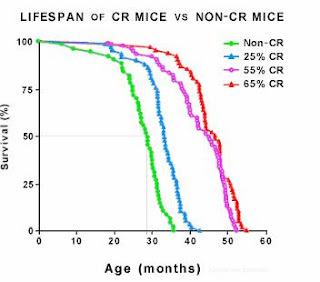 The chart on the right shows the lifespan of calorie restricted mice versus non-calorie restricted mice. The greater the restriction, the longer the lifespan until restriction is great enough to cause starvation. This chart could represent daily calorie restriction or every other day feeding. Interesting study...I may just have to experiment on myself. 500 calories/day would be super hard though. Sheesh! No matter what, it's just not easy, is it?